Tracing the extraordinary trajectory of the great Roman emperor’s life, Goldsworthy covers not only the great Roman emperor’s accomplishments as charismatic orator, conquering general, and powerful dictator but also lesser-known chapters during which he was high priest of an exotic cult, captive of pirates, seducer not only of Cleopatra but also of the wives of his two main political rivals, and rebel condemned by his own country. 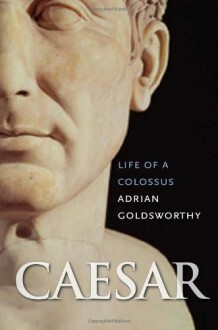 Ultimately, Goldsworthy realizes the full complexity of Caesar’s character and shows why his political and military leadership continues to resonate some two thousand years later.In the introduction to his biography of the great Roman emperor, Adrian Goldsworthy writes, “Caesar was at times many things, including a fugitive, prisoner, rising politician, army leader, legal advocate, rebel, dictator . . . as well as husband, father, lover and adulterer.” In this landmark biography, Goldsworthy examines Caesar as military leader, all of these roles and places his subject firmly within the context of Roman society in the first century B.C.